Elfin Oak originally carved in 1911 and maintained for over 40 years by sculptor Ivor Innes. With his grateful thanks also to Spike Miligan CBE and his friends whose interest and support enabled complete restoration of the wee folk, 1996. HRH the Prince of Wales unveiled this plaque, presented by the Elfin Oak Appeal Fund, 12 June 1997. For hundreds of years, no one knows for how many, this tree lived its life quietly and anonymously in Richmond Park. When reduced by time to a giant (20 foot girth), venerable bole it was moved to Kensington Gardens, funded by Lady Fortescue. This was brought about by George Lansbury. As an unusually active First Commissioner of Works, 1929-31, he had the trunk moved here and carved by Innes to add to the attractions in Kensington Gardens. A modern plaque on the tree says the carving was done in 1911 but that seems to be mistaken. The Listing entry say the tree was carved at the time of the move, 1928-30. This seems most likely since, if the carvings had existed in Richmond Park, for 20 years, we feel there would be more information about the tree's presence there (such as the exact location) and probably there would have been a campaign by the locals to keep it. The carved tree was unveiled in 1930 by the Mayoress of Kensington, Mrs Robinson. Note, she was not Mayor in her own right but was merely married to the Mayor, Dr Henry Robinson. Presumably a woman's touch was felt appropriate for such a child-friendly item. Another wife, the sculptor's, was also involved. In 1930 Elsie Innes published 'The Elfin Oak of Kensington Gardens' with text by Elsie and illustrations by Ivor. The Library Time Machine reproduces much of the content. Restored in 1966 and again in 1996, on both occasions at the instigation of Spike Milligan, who actually paid for the 1966 works himself. The best photos we have found of the little characters are at A View from the Mirror. In our efforts to identify the donors of the Elfin Oak and the clock tower we contacted the Kensington and Chelsea Local Studies Library. The staff there were extremely helpful, showing us their collection of ephemera for the Oak and following up some leads we had. Interestingly they have nothing on the clock tower. The clipping from the Kensington News, 1 August 1930, is worth reporting in full: "Unveiling the Elfin Tree - Mayor’s Witty Speech - Laurels for Lansbury. The Mayoress of Kensington unveiled the “Elfin Tree” in Kensington Gardens on Friday afternoon. As explained in our last week’s issue, the tree trunk is that of a very old pollarded oak, formerly in Richmond Park. Mr Ivor Innes, the artist, has by chipping and scraping made out of the distortions of growth and grain a large number of small animals and fairies. The trunk is in the Children’s Playground and is bound to attract a great deal of interest. The ceremony of unveiling was witnessed by a large number of people. The Mayor and Mayoress were received by the First Commissioner of Works, Mr Lansbury, the Mayoress being presented with a bouquet of flowers grown in the Royal Parks. Sir Lionel Earl introduced the artist, Mr Ivor Innes, and the Hon. Lady Fortescue. 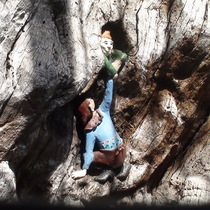 The First Commissioner of Works, in the course of a short address, recalled the circumstances in which the “Elfin Tree” was set up and asked the Mayoress of Kensington to unveil the tree. Mrs Robinson then removed the veil from the tree and revealed the remarkable work of the artist. Among those present included – Alderman Sir Alfred and Lady Rice-Oxley, Mrs Percy Gates, Mrs Barrs, Mrs Gordon Bird, Councillor Miss Fraser, Councillor Miss Keeling, Councillor Brig.-General Kelly and Mrs Kelly, Councillor Mrs Price, Councillor Miss Cunningham, Councillor and Mrs Henry Goldsmith, Councillor and Mrs Arthur Hudson, Councillor and Mrs Jenkins, Mrs Kahn, Councillor F. W. Parsons and Councillor Miss Pennefather." We believe “Sir Lionel Earl" was actually Sir Lionel Earle, (1866–1948) Permanent Secretary to the Office of Works and Public Buildings at the time. And we wonder whether "Mrs Kahn" was Adelaide, neé Wolff (1875 - 1949) wife of Otto Kahn (1867 – 1934). He was a German-born American investment banker, collector, philanthropist, and patron of the arts. She died in London. This Kensington News article demolishes a theory we had. The Listing entry for the Elfin tree states that the sculpture work was done 1928-30 and that the tree was donated (which we interpret as "funded") by 'Lady Fortescue' and we thought we had found that lady, thinking she was Lady Emily Fortescue (1856 - 1929). Not only did we think that she, or more likely her family, might have funded the Elfin Oak but we had a good case for that Fortescue family also being responsible for the nearby Time Flies clock tower. But the newspaper says that Lady Fortescue was present at the unveiling in 1930 so she cannot have died the previous year! All our research work demolished. And we are now left with two mysteries: who erected the clock tower and also who was the Lady Fortescue who erected the Elfin Oak? Stop Press: Via Facebook Scott Martin and Deborah Hart Stock have both independently identified Winifred Fortescue, nee Beech, as the Lady Fortescue we are looking for. She wrote in her book ‘Perfume from Provence’ about her own, much smaller, version of the Elfin Oak, “by the artist who fashioned the Elfin Oak in Kensington Gardens”. Excellent that’s our Lady! And, we are delighted to find, she was sister-in-law to the Emily Fortescue for whom we have a good case as the donor of the nearby Clock Tower – so our argument that it was (members of) the same family that donated both items holds good. We will, shortly, change our pages to reflect this new information. Many thanks to Scott and Deborah.